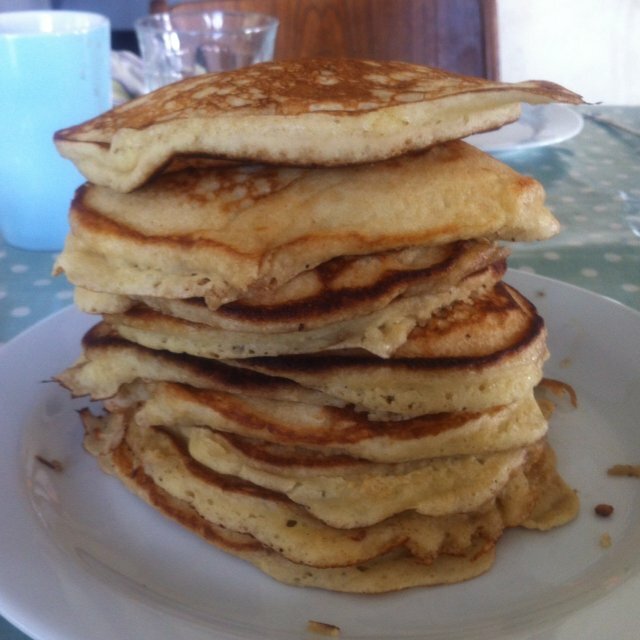 The amount of buttermilk you use will determine how thick these pancakes are. Start with the smaller amount suggested and add more if the batter seems too thick. Try to have the buttermilk at room temperature before mixing and take care not to overbeat. Beat thebuttermilk, butter, and egg lightly in a mixing bowl. Mix the flour, baking soda, sugar and salt and add them all at once to the first mixture, stirring just enough to dampen the flour. Lightly butter or grease a griddle or frying pan and set over moderate heat. Drop by spoonfuls onto the griddle and bake until the cakes are full of bubbles on the top and undersides are lightly browned. Flip just once and brown the other side. Keep warm at low oven until you have enough to begin serving.